A sweet niece is getting married soon so I wanted to make her a special bridal shower card. 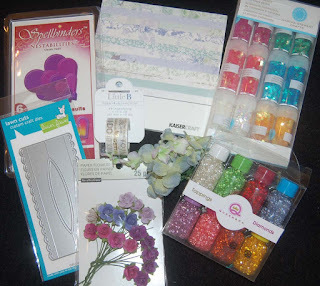 My inspiration started from a Kaiser Craft paper pad that I purchased from HM Ben Franklin Crafts. I love the sheets of lavender floral printed paper. I thought a shaker card that rained down Martha Stewart heart confetti and sparkly Queen and Co. diamonds would be the perfect interactive effect. 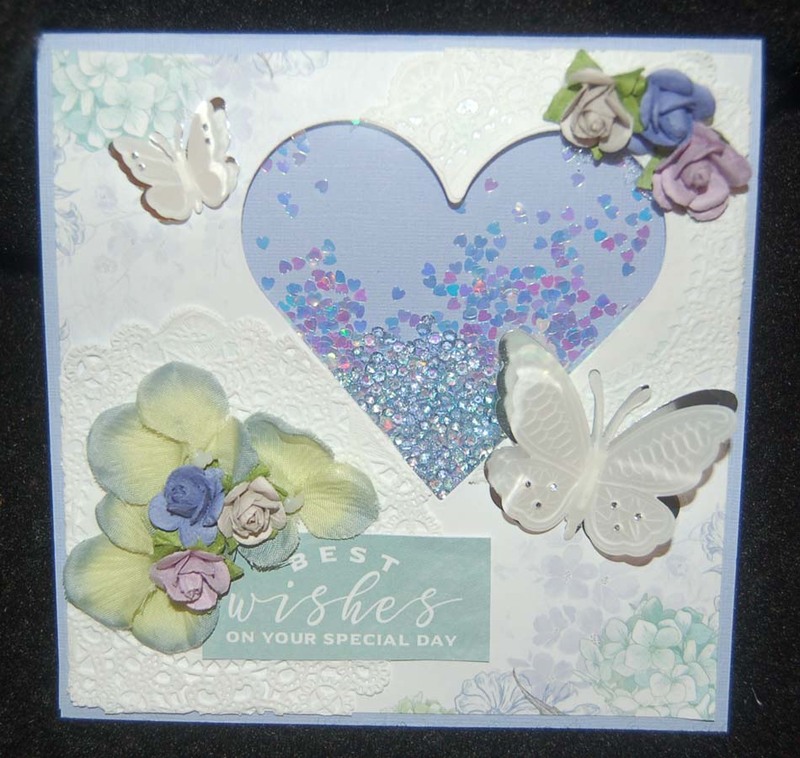 I added paper doilies, color coordinating flowers, and Martha Stewart parchment sticker butterflies to give the card a very feminine look. The sentiment was cut out from a sheet in the Kaiser Craft paper pad which contains lots of useful color-coordinated words. On the inside of the card I adhered a scalloped gift card holder made with the Lawn Fawn die available now at HM Ben Franklin Crafts. 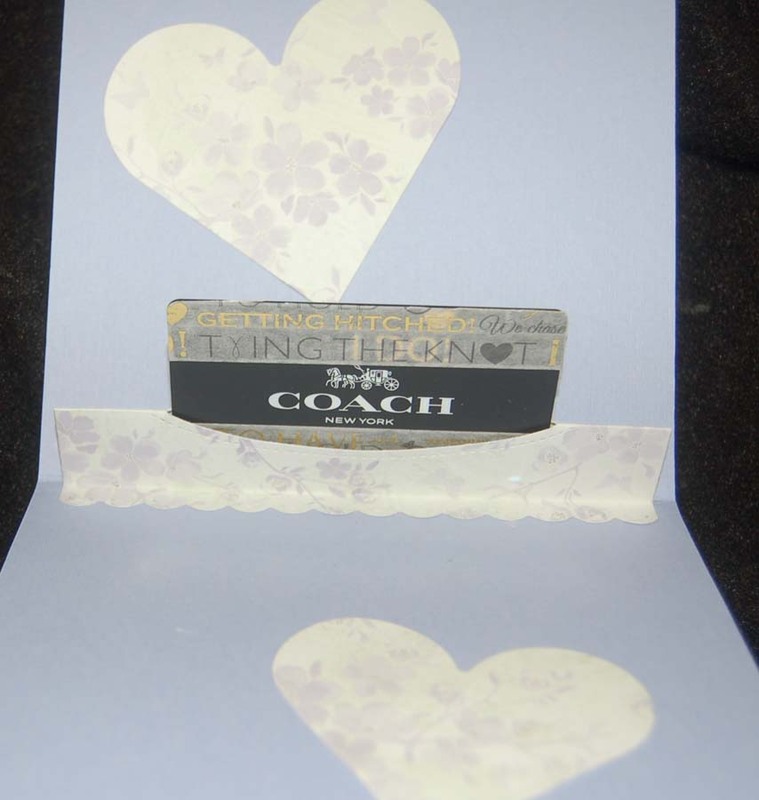 To make the all black Coach gift card less severe, I added two strips of Little B wedding washi tape. 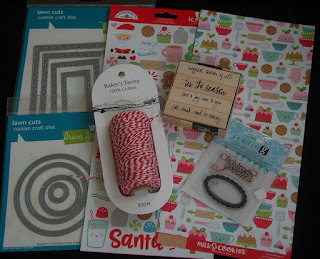 I plan to add the same washi tape to the envelope to coordinate everything together. Happily, this card was easy to create and turned out pretty close to the vision I had when I thought of the bride-to-be. Hope this non-holiday project is of interest to you....please leave a comment if you can spare the time. I enjoy hearing from you! 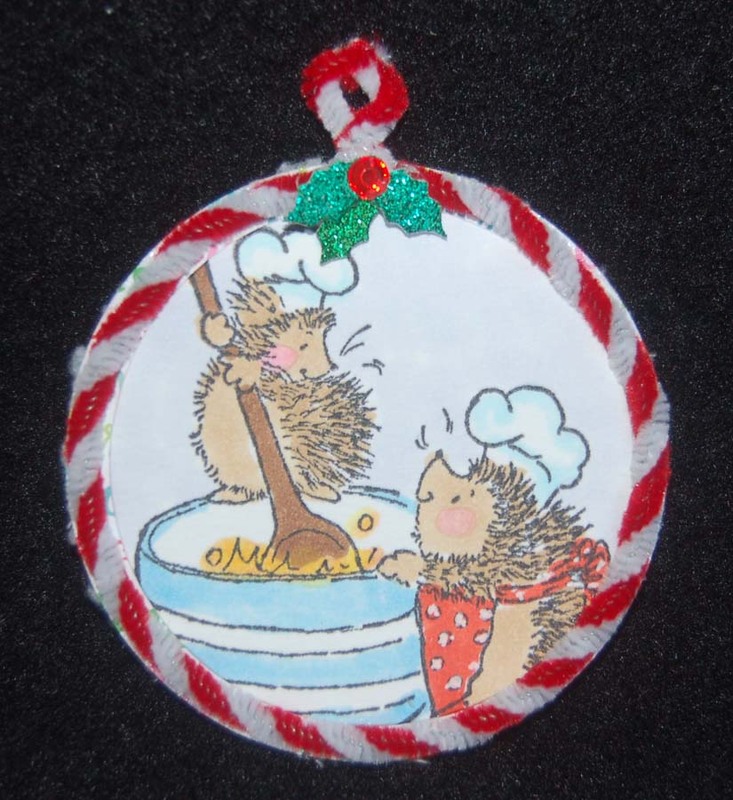 This sleeping Penny Black mouse image is what I feel like after every Christmas season. 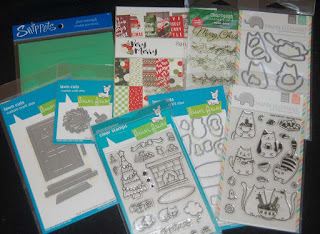 As I do every year, I ran out of time to use all my sweet stamps, papers and dies before Dec. 25th. 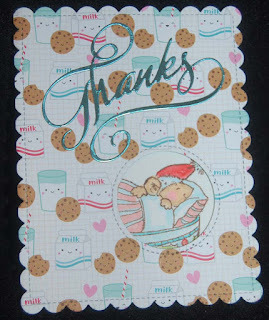 in an effort to somewhat rectify this yearly happening, I've decided to combine the cookies and milk Doodlebug Designs paper with the PB stamp image. I also used Lawn Fawn frame dies to cut the scalloped card base, inside white watercolor paper and the stitched 'mouse' hole. 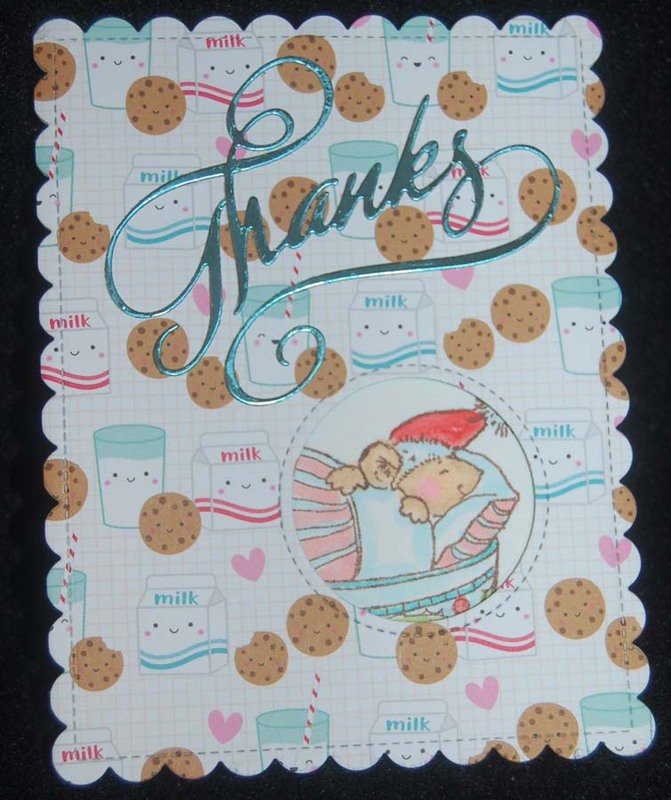 The 'thanks' was cut from aqua foil paper and run through a Xyron machine to apply adhesive. I colored the mouse in the teacup with Copic pens and some watercolor pencils. 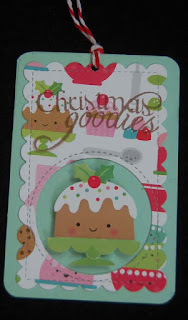 It was satisfying to get to use these Xmas items on these thank you notes and not have to wait until next year. I hope you had a merry holiday season and will take the time to write thank you notes for those lovingly chosen gifts given to you. Thank you for all your kind comments this year and have a wonderful 2018! I love the Doodlebug Designs 12x12 papers and stickers with cute food emojis that I purchased at HM Ben Franklin Crafts. Using a Lawn Fawn stitched scalloped rectangle die, I first cut out a piece of the printed paper. 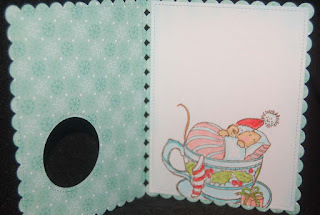 From this rectangle I used a LF stitched circle die and cut out a porthole. Next I cut a mint green rectangle slightly bigger than the scalloped rectangle and used a corner cropper to snip off the four corners. I used double stick tape to adhere the scalloped rectangle to the mint green rectangle. I placed a foam square under the food sticker and dusted with cornstarch the sticky back of the sticker before removing the foam square backing. Raising the sticker off the back makes it pop and look cuter. 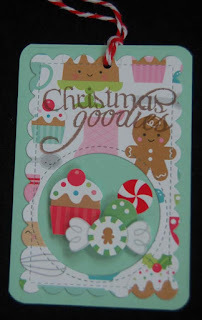 I used the Studio G ' Christmas goodies' stamp on the front of the tag and the Hero Arts 'eat, drink, and be merry' stamp on the back. 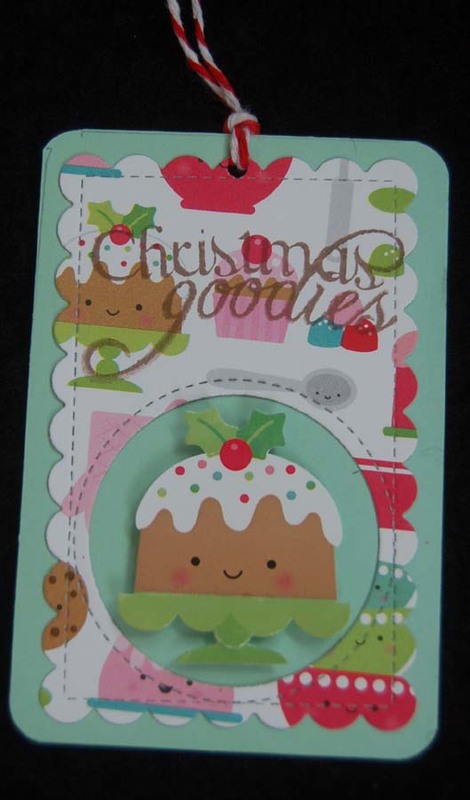 A small hole was punched at the top of the tag and peppermint twine was added. 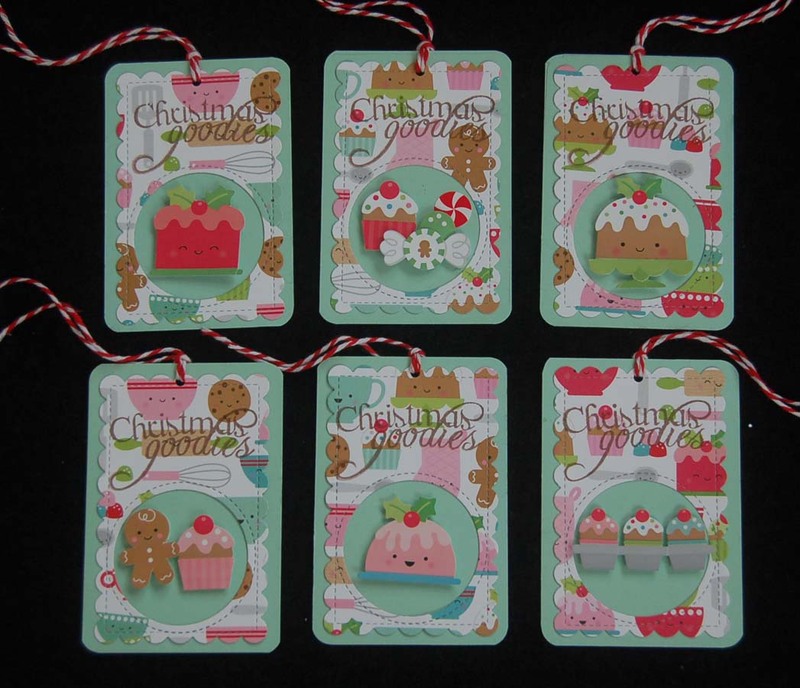 I am very pleased with the happy look of these tags and think they will really add to the festive look of my treat bags/boxes. 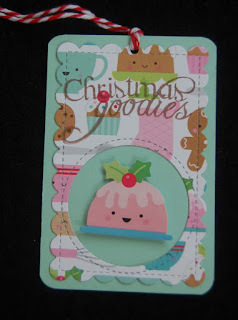 I hope you will try to make tags like these because they are so easy and require only die cutting and stamping. Go ahead....you can always make some for next year! 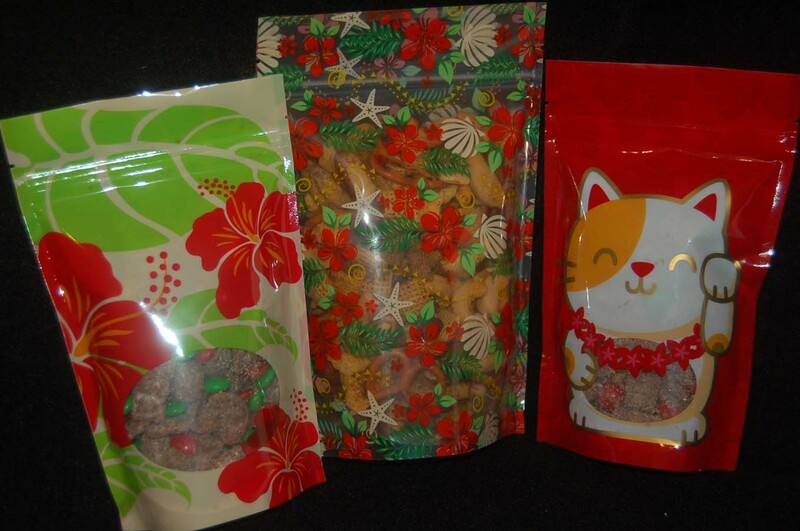 If you're looking for some attractive packaging for your homemade goodies, go to HM Ben Franklin Crafts where they have a beautiful array of ziploc bags by Great Lines Hawaii. 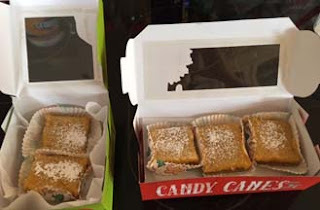 HM BFC also has dozens of gorgeous pre-made boxes for you to fill with cookies, bars, or cupcakes and tie up with ribbons and your handmade tags. 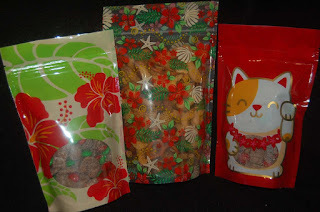 I filled some of mine with lilikoi bars because we had a surplus of lilikoi (passion fruit) this year. 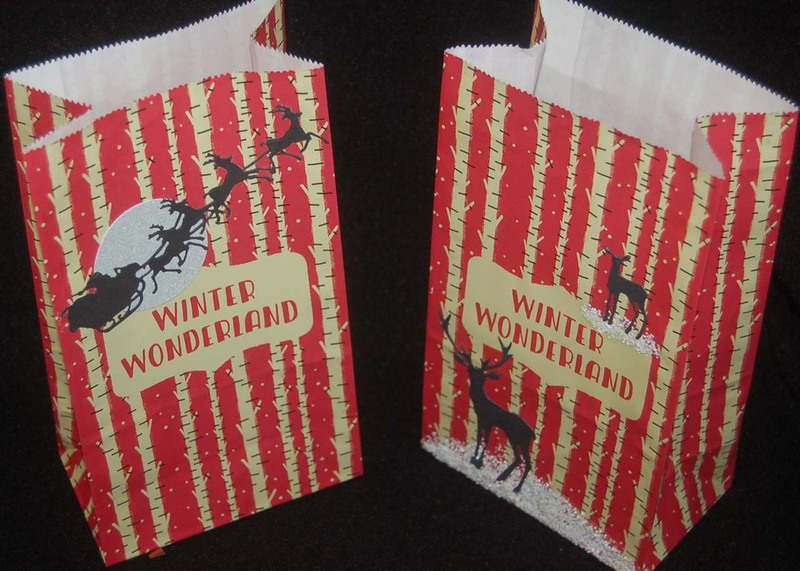 Also if you are trying to economize on your packaging, HM Ben Franklin Crafts has many styles of plain paper bags from Japan which you can buy in bulk and decorate simply. 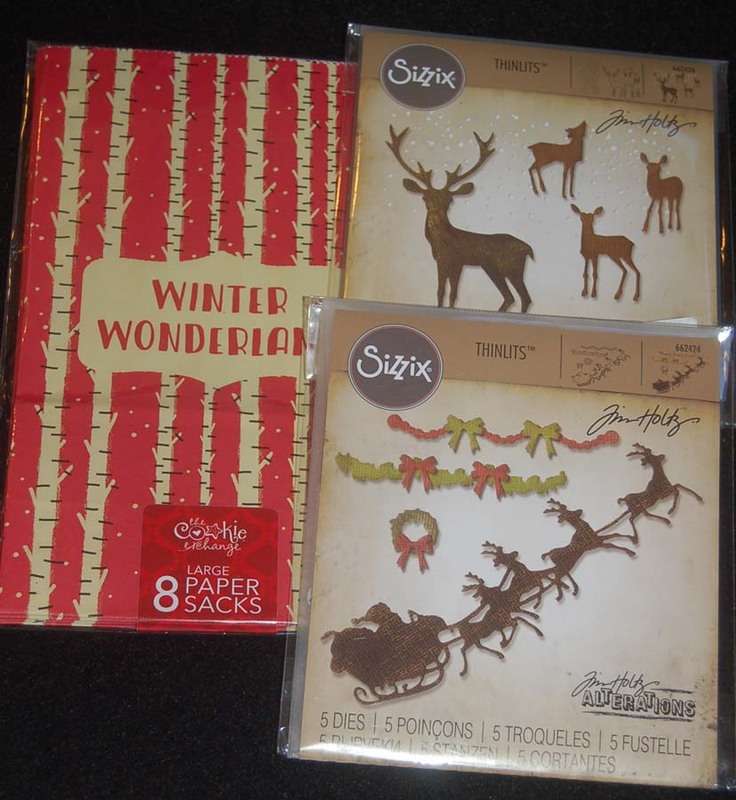 Here I just added some Sizzix Tim Holtz die cuts. 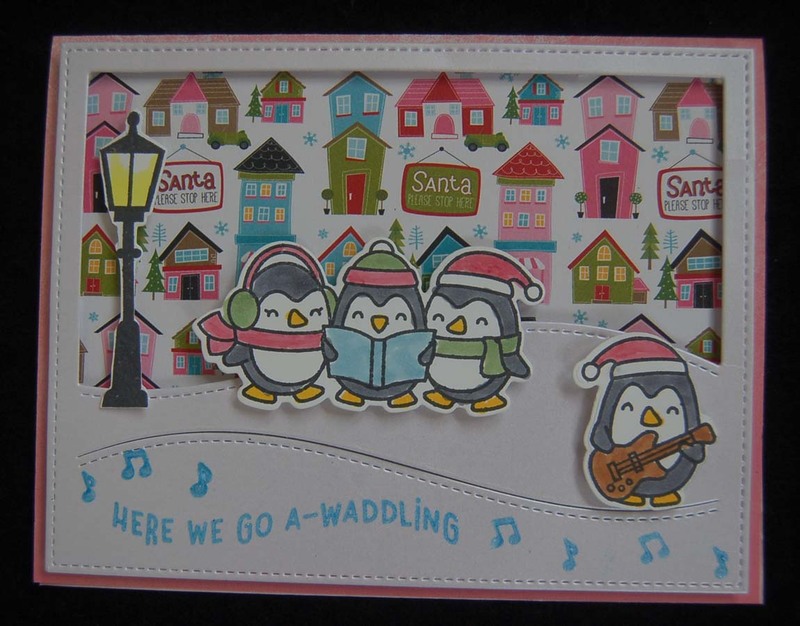 The Santa sleigh one has a die cut silver circle in the background and the reindeer are standing in some white glitter. 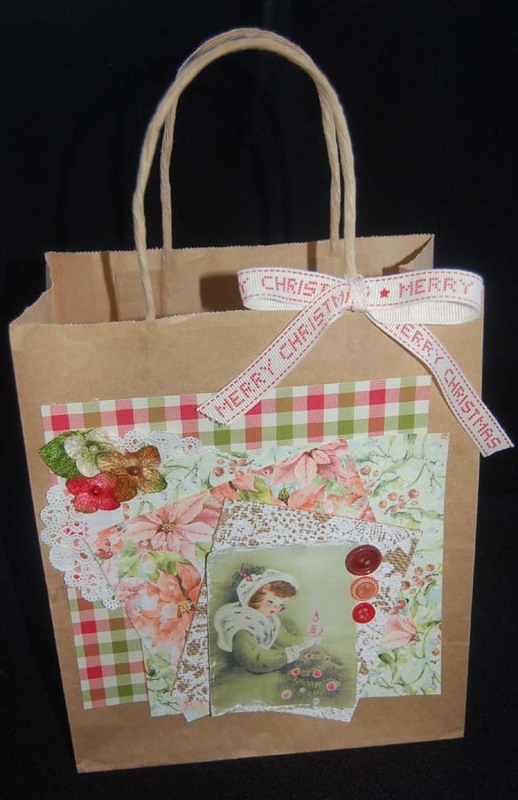 Hope you are packing up your goodies and making them more appealing with some pretty boxes or bags. 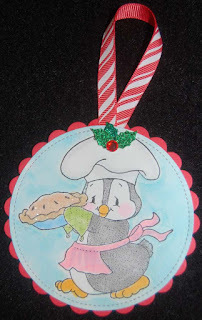 This is the season to craft, cook, and decorate! 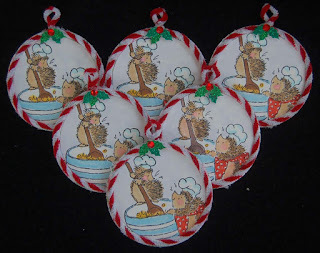 After making the last set of tags for my homemade food gifts, I realized that they were too big for the goodie bags and boxes so I decided to make some smaller ones using a sweet Penny Black hedgehog stamp. 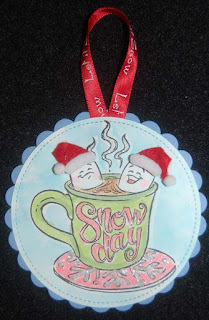 After stamping the image on watercolor paper, I die cut it with a Sizzix circle die (from a set of 8 ). 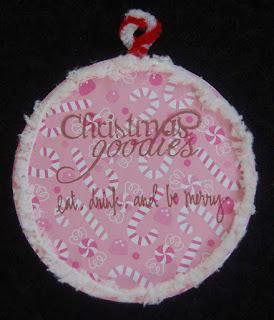 Using one circle die size bigger, I cut out a piece of Doodlebug Designs candy cane paper from the Milk and Cookies line and glued it to the colored (with Copic pens) image circle. 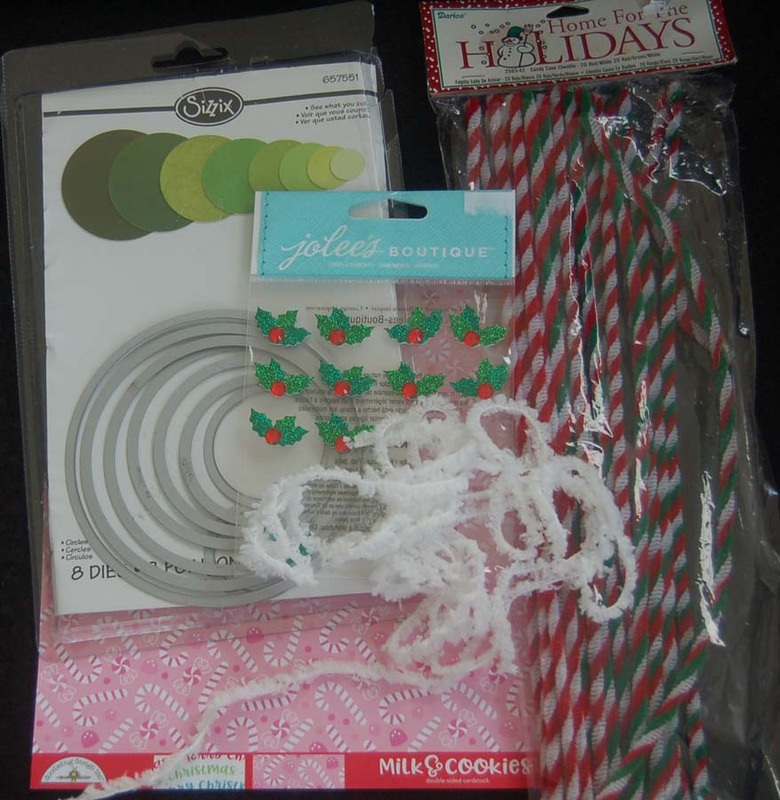 I shaped a 12" candy cane pipe cleaner into a circle to fit the rim between the two circles. The top ends of the pipe cleaner just barely will form a loop. The pipe cleaner hoop was glued down with Beacon 1-2-3 glue and a Jolee holly sticker was added. 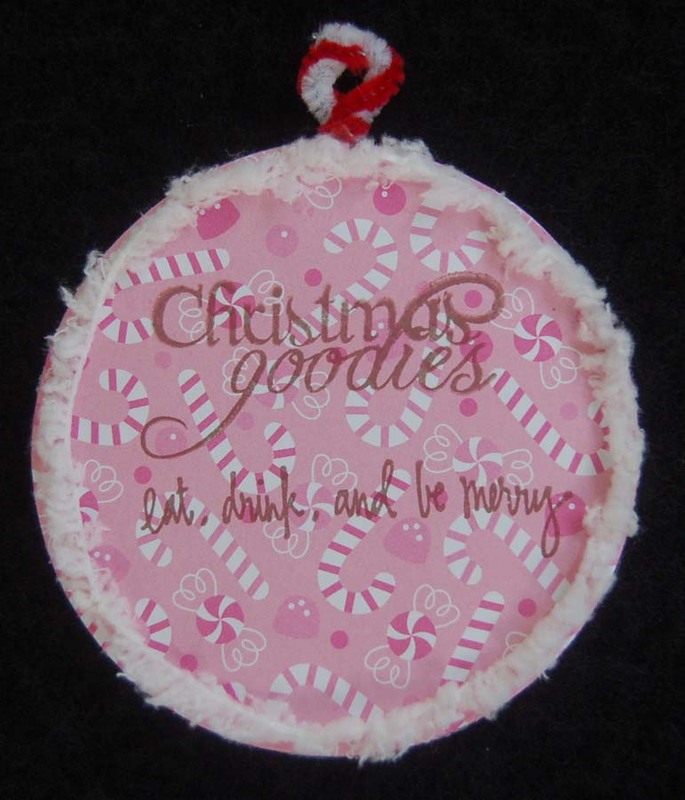 Oh yes, I stamped the candy cane side of the circle with 'Christmas goodies' (Studio G) and 'eat, drink and be merry' (Hero Arts set). To finish off the back, I glued some furry white yarn to the edge of the circle. 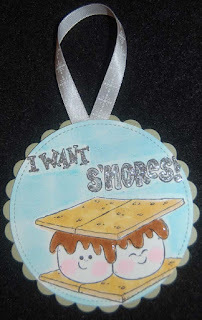 I like these tags better than the first set I made and I know they won't dwarf the goodie bags/boxes. LOL! Keep on crafting...you still have time! 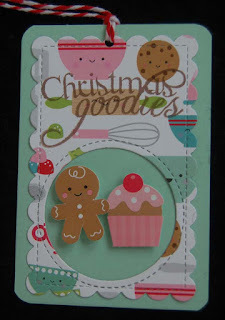 Thank goodness for dies especially ones that coordinate with stamps. I probably wouldn't have attempted these cards for my cat loving boys if I had to fussy cut everything. 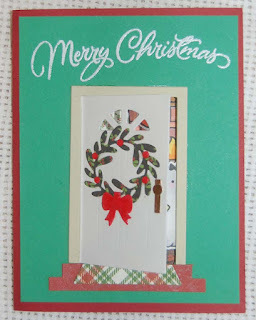 The door front started with the Lawn Fawn door and wreath die sets. 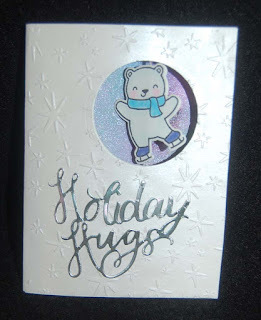 I stamped the Hero Arts words with white ink and heat embossed with white embossing powder. 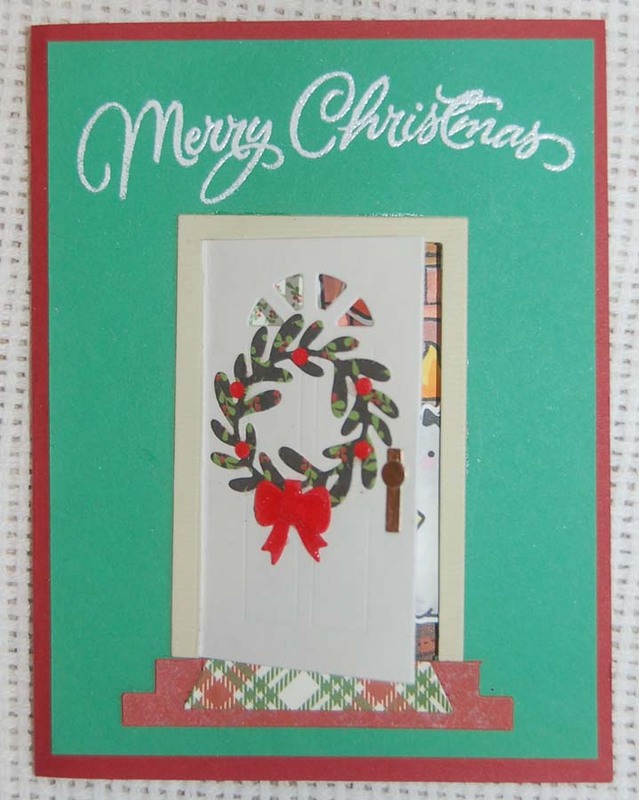 After double stick taping the door down, I carefully used a craft knife to cut out the door opening before adding the wreath, door mat and door knob. 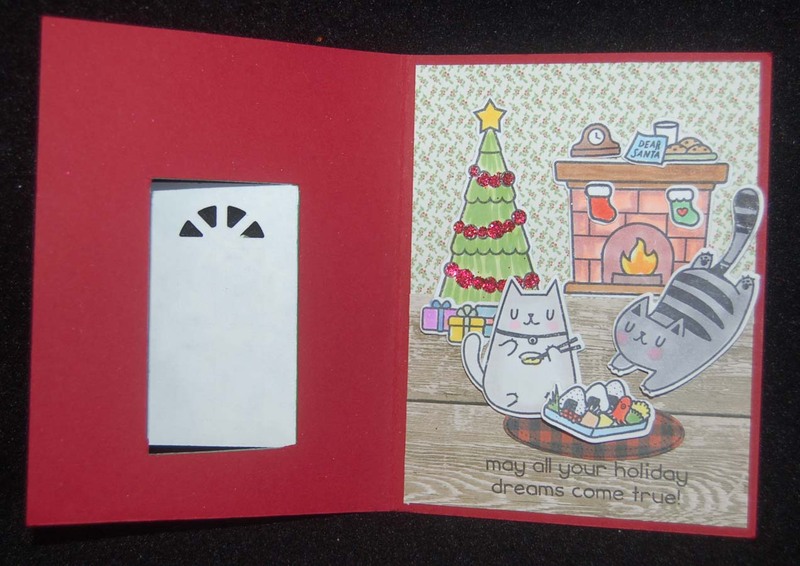 This card is for my son who has a pair of gray sister cats. I imagine they would love saimin if they were allowed to eat it. For my other son who owns two young cats, I tried to find two cat images from the Mama Elephant stamp set that could be colored to resemble his cats. None of the cats are chubby, but skinny cats are not as cute....LOL! 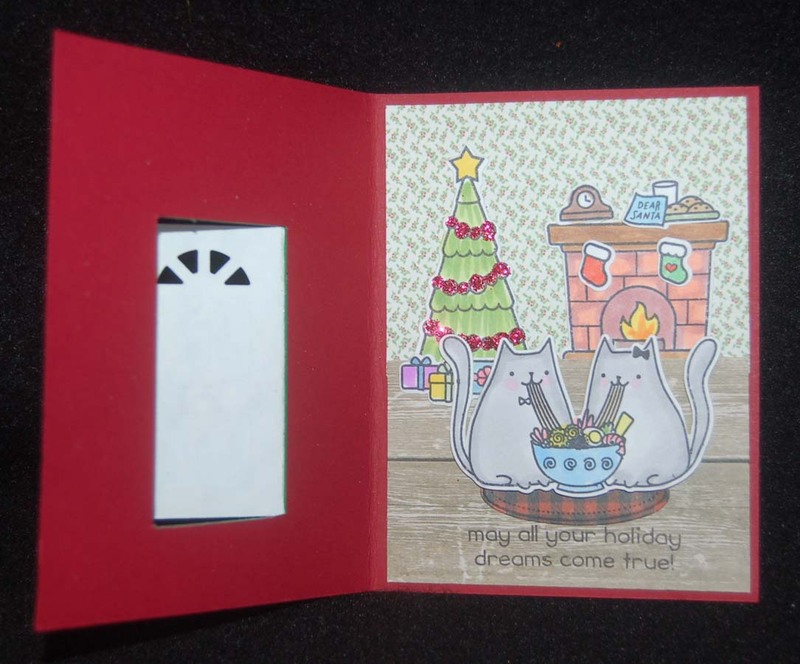 I think the Mama Elephant (Nom Nom kitties) cat set and the Lawn Fawn (Christmas dreams) sets work well together even though they were not designed to match. 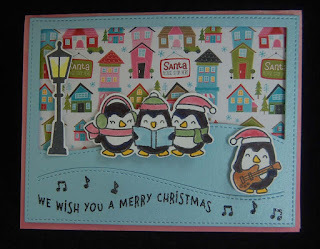 I was pleased to be able to craft a special card for each son. 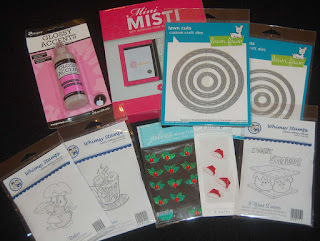 I hope your crafting is going well and your holiday projects will get done on time....if not, we'll start earlier next year, right...wink!wink!... I will....promise! Although I don't like making multiples, I did want to make a 'tuck-in' to mail with our family holiday newsletter. These are for friends who we think of all year, but with whom we don't always exchange gifts. 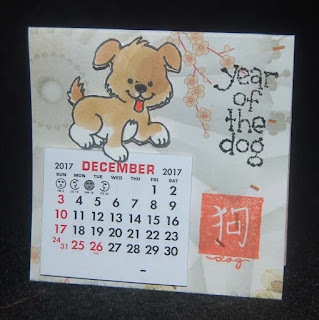 The Dandelion Designs' Year of the Dog stamp set (purchased at HM Ben Franklin Crafts) seemed perfect for this mini calendar because it was simple and so many of our friends are dog owners. I started with KaiserCraft 12x12 printed Asian design card stock (also from HM BFC). These sheets will make four calendars (five if the design is not in one direction). First I cut 3"x 8" strips and then marked them across at 1/2", 1-1/4", 2" and 5". Fold the strips so that the bottom can be accordion folded and the last tab overlaps the back. A scoreboard would be ideal and easier for this part. 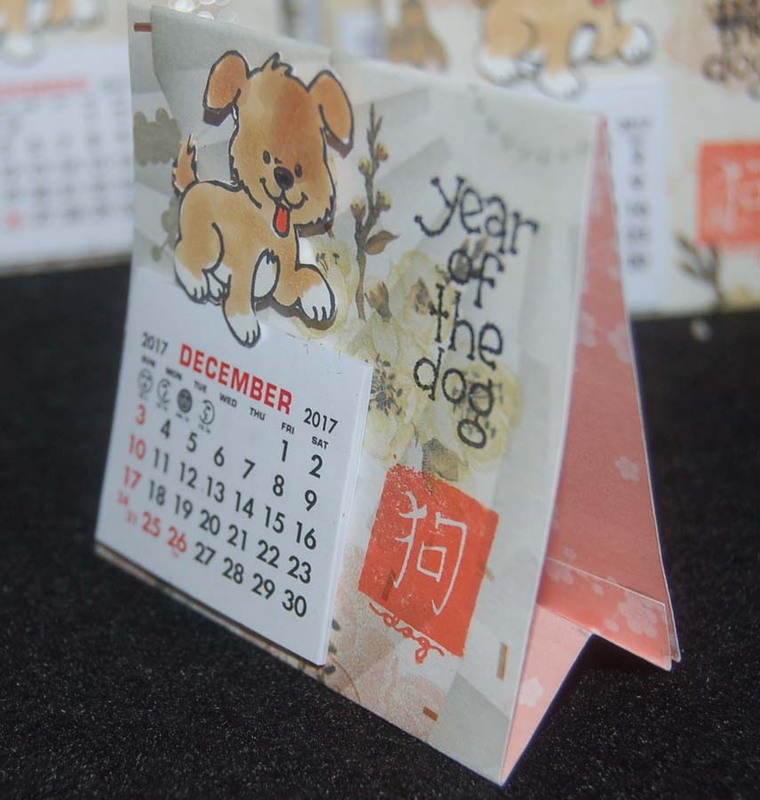 This side-view shows how to assemble the calendar base and use double stick tape to attach the back flap. The mini calendars (1-1/2" x 1-5/8") were ordered from Vippies. The dogs were colored with Copic pens and fussy cut by hand. 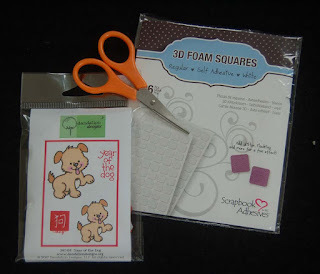 (My favorite scissors for fussy cutting is a Fiskar mini.) The words were stamped and heat embossed with Nuvo black sparkle powder. I chose lightly printed KaiserCraft papers to make these calendars so that the red character stamp would show up. 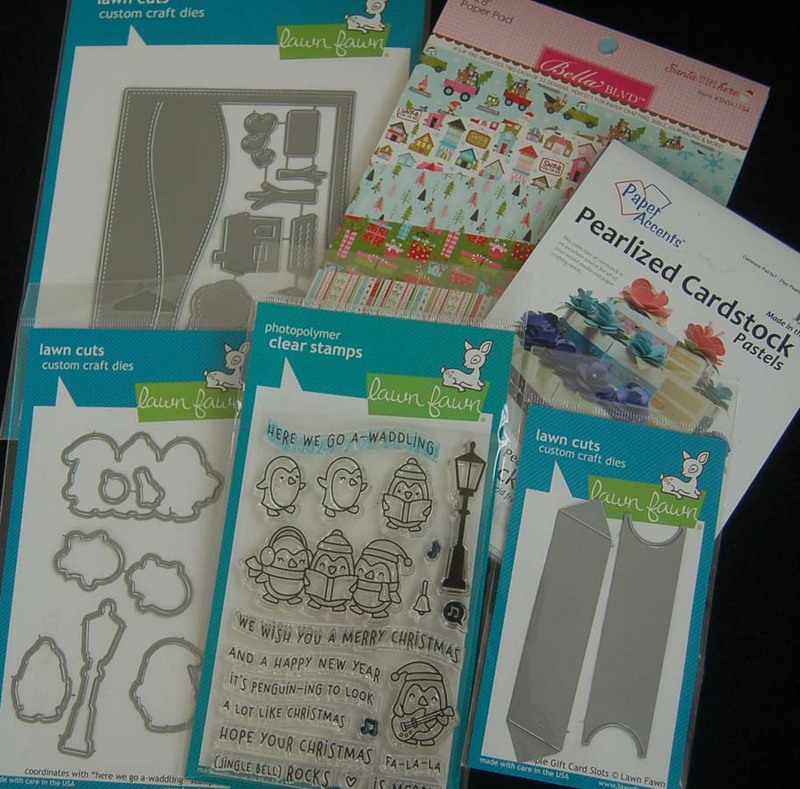 I think you should try making multiple mini calendars because they are so easy and require very few supplies. 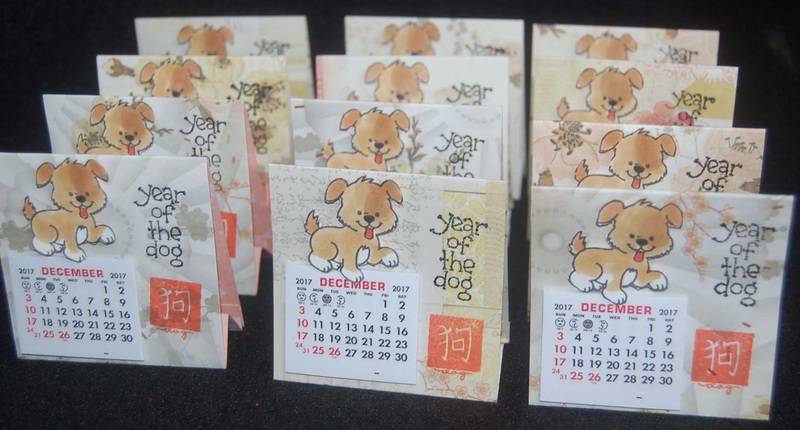 These little calendars fold up flat for mailing and are fun to give out to spread holiday cheer. 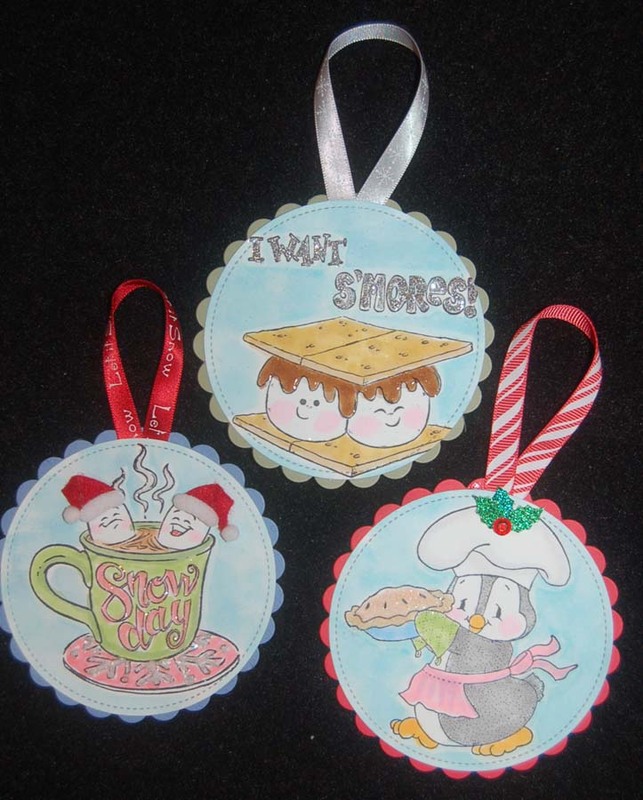 Craft some happiness for this wonderful time of the year! 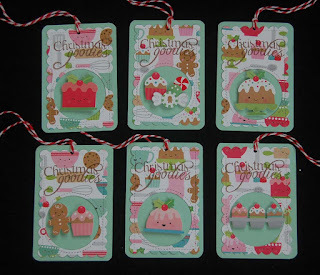 These tags started with some cute Whimsy Stamps and Lawn Fawn circular dies. It was simple work to die cut the scalloped circle from colored card stock and the inner stitched circle from white marker paper. I colored the images in with Copic markers and then made a plain paper mask to cover the image while applying the background color (I used Distress ink on a blender). For added sparkle I applies glitter, Glossy Accents on the chocolate, and sticker holly or Santa hats. Before double-stick taping the circles together, I glued the ribbon loop in place. I kept these tags simple and left lots of writing space on the back because these will be attached to my food gifts of hot chocolate mix plus marshmallows, graham crackers with a chocolate bar and marshmallows, or a homemade pie. Tag up some fantastic food gifts for friends/family who will certainly be delighted with an edible holiday gift this year! Whenever I see vintage Christmas papers I get excited because they remind me of my childhood. 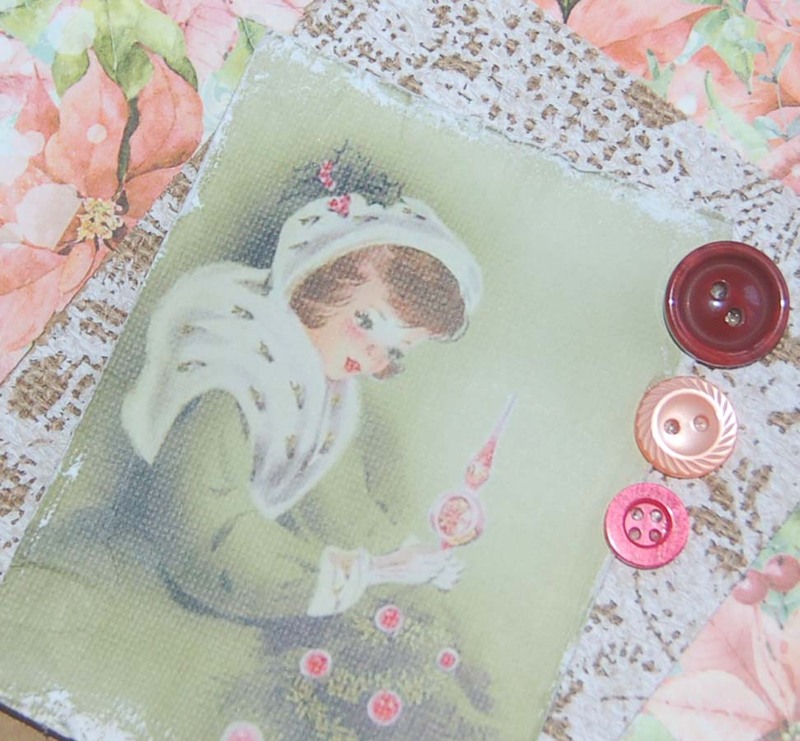 It was a time when children and adults sent Xmas cards with sweet images and greetings. Gifts were wrapped carefully with pretty papers and tied with shiny ribbons. 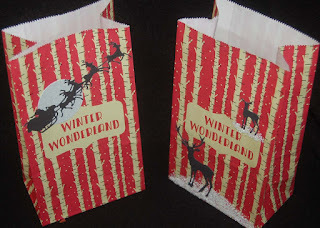 Today it just seems simpler to tissue wrap a gift and present it in a glossy store bought holiday bag. 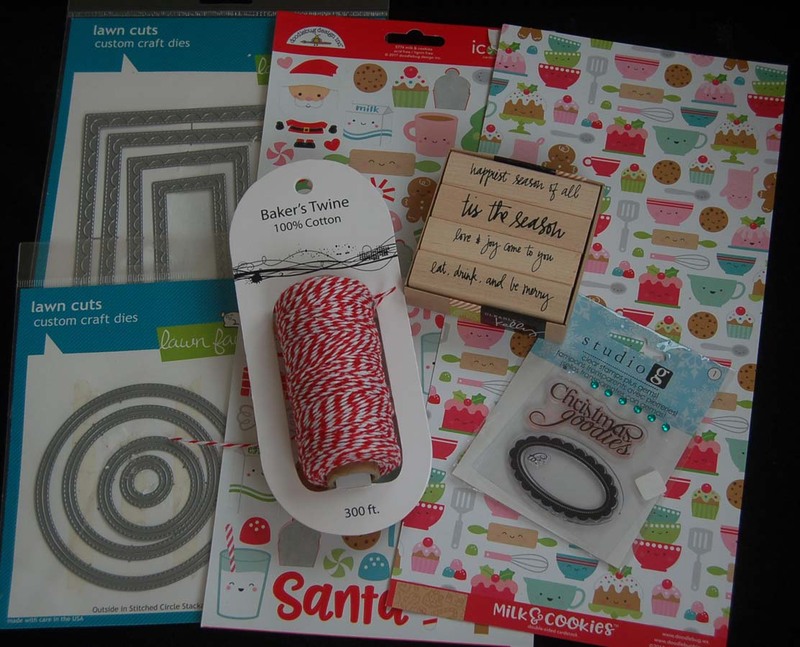 To feel like I at least attempted to wrap gifts for special friends and relatives, I decided to use the special 12x12 decorated Xmas papers I purchased at HM Ben Franklin Crafts. By angling the Authentique and Bo Bunny sheets, I was able to show off the lovely colors and prints on the front of a plain Kraft bag. 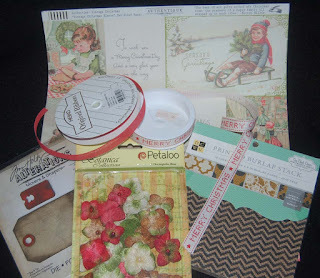 The leftover paper scraps made a charming tag that included more buttons, a Petaloo blossom (from BFC) and vintage tag cut from an Authentic paper. The burlap part of the tag was cut with a Sizzix Tim Holtz die because the burlap was quite thick. You can easily cut the burlap sheet with scissors if you don't own the die. 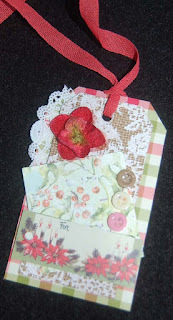 I was pleased to use the Heiko ribbon (from Celebrations) because it has a vintage, rustic color and texture. Oh yes, the ribbon on the bag also came from HM Ben Franklin Crafts. It has a great woven embroidered look. I plan to make many more gift bags and tags because these were so easy and fun to make. Also, I can leave them folded up until needed and even take them on trips to have an instant gift wrap that won't be a roughed up by airport inspection. 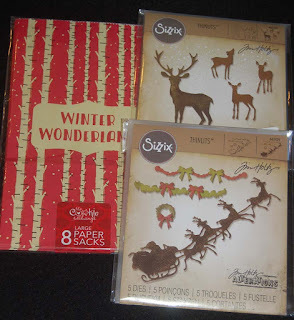 I hope this post has inspired you to play with pretty papers and embellishments to craft your own Xmas bags and tags. 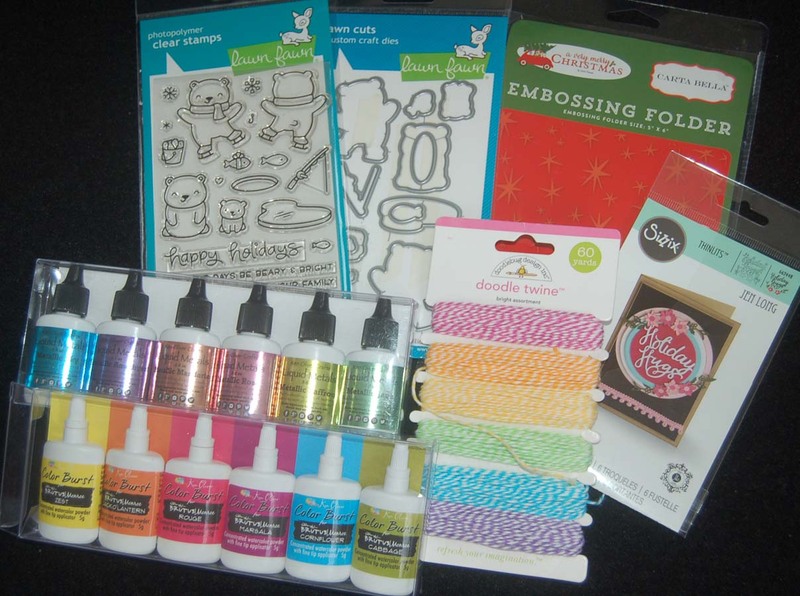 Enjoy this holiday crafting season! I've been having fun playing with the new Ken Oliver Color Burst powders and Liquid Metals. Although there are countless ways you could use these products, I chose to show how a color applied watercolor paper background panel could really enhance a simple card. I started by first randomly adding some colors to a water sprayed piece of watercolor paper and swirling them until I was pleased with the results. I let the colored papers dry as I proceeded to make the rest of the card. For each card I needed two 8"x5-1/2"panels of white card stock folded in half and one more panel of the same sized pearlized vellum paper. I put all three pieces together (the vellum on the outside) and folded them in half, trimming the edges as needed. 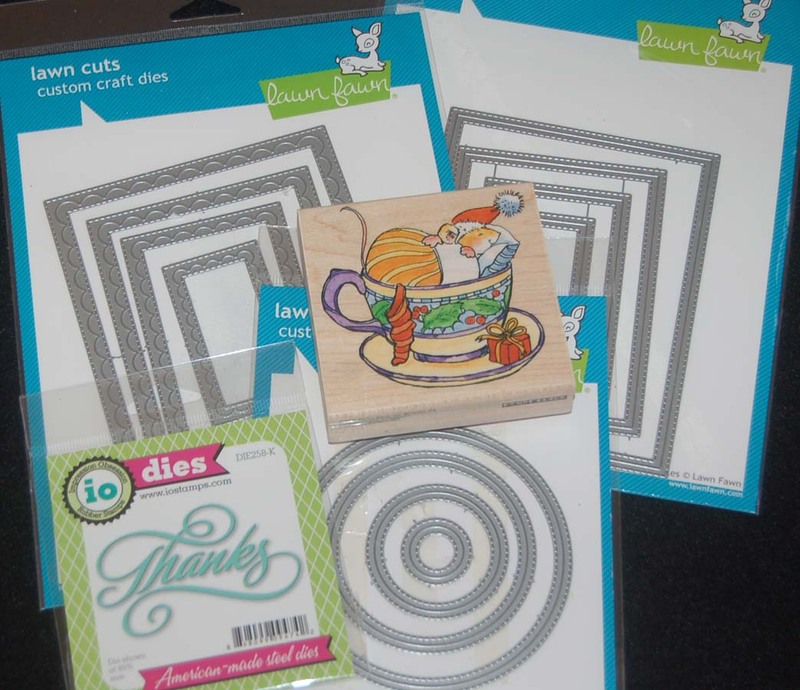 Next, I used a 2" circle die to cut the opening in both card stock pieces at the same time. 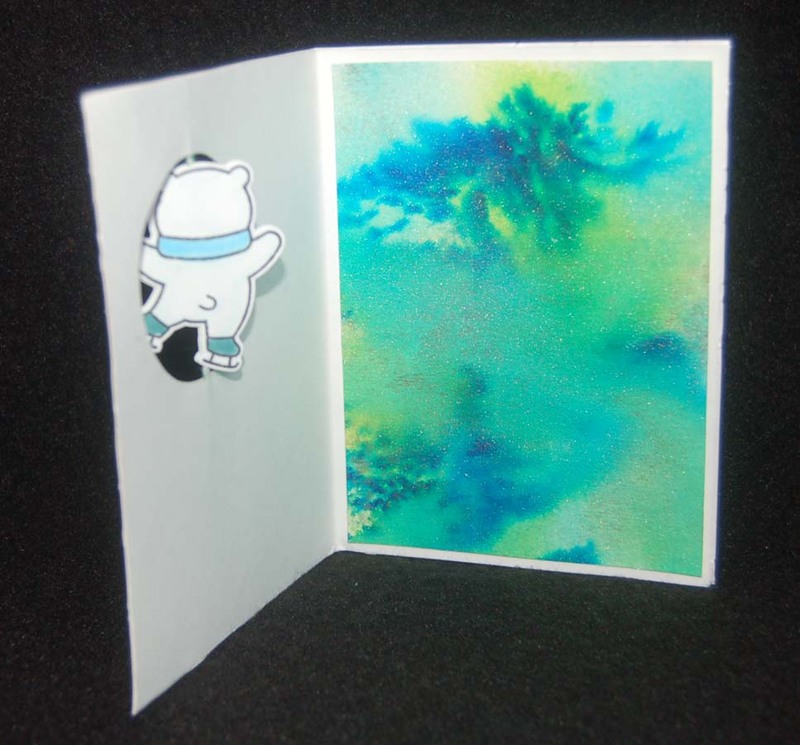 I stamped the front and back of the bear on white marker paper and colored them in with Copic pens. I used the matching Lawn Fawn dies (purchased at HM Ben Franklin Crafts) to cut them out. 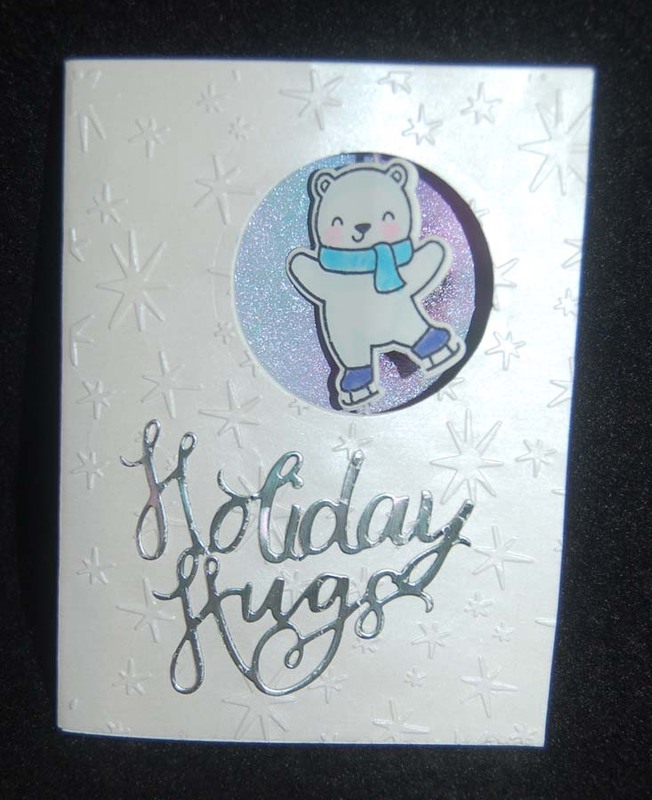 I glued a piece of twine between the two die cut bears and glued the twine within the circles of the card stock base, adding double stick tape to the rest of the card edges. For the outside of the card I matched up the folded vellum sheet and traced the 2" hole onto it before lining up the circle die. 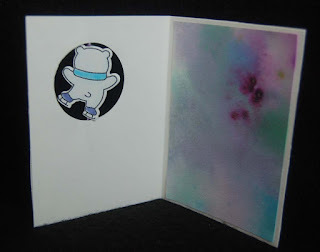 After cutting the circle in the vellum, I ran the vellum piece in the embossing folder through my Big Shot machine. 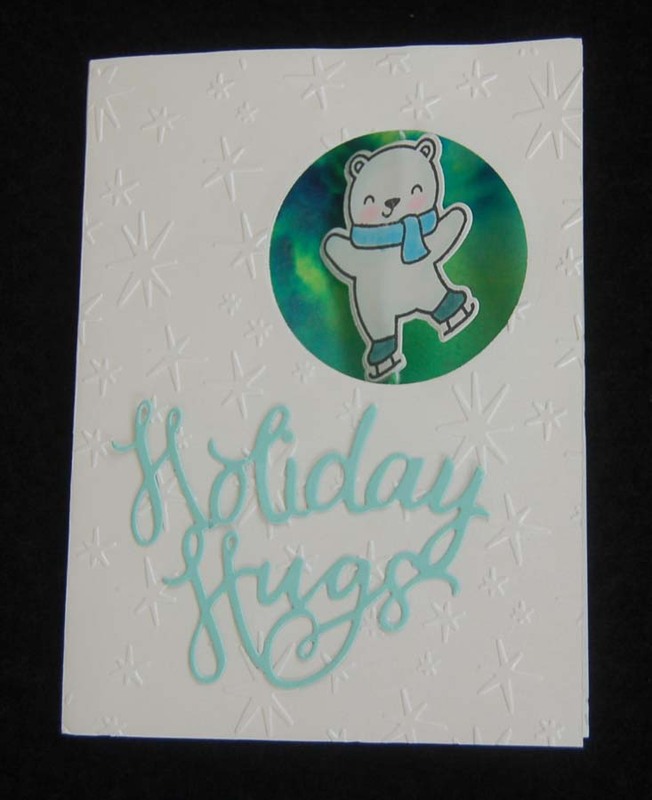 I used double stick tape to adhere the embossed vellum to the card base before adding the die cut (from DCWV foil paper) 'Holiday Hugs'(Sizzix). (I ran the words through a Xyron sticker maker to apply some adhesive and dusted the card with cornstarch to remove unwanted stickiness.) 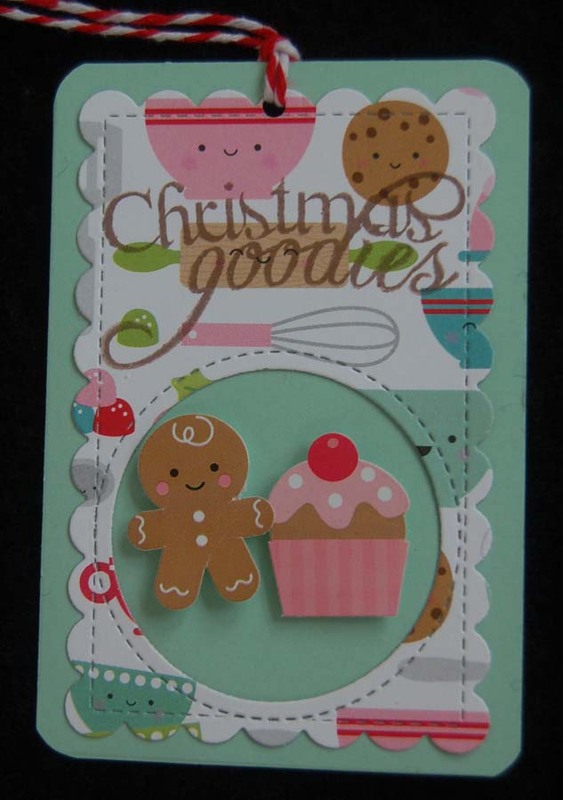 Finally, I added the trimmed to size dried color panel to the back of the card. I love the brightness of the first card, but I think the paler second card allows me to write a message more easily. Perhaps a white pen or silver one will show nicely on the darker colors. I wish that my photography showed the subtle shimmer of the metallic liquid inks but I guess you'll have to try them out for yourself. Time to go holiday shopping at HM Ben Franklin Crafts! 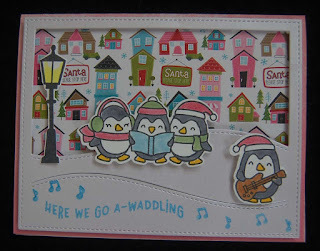 The Lawn Fawn "Here-We-Go-A Waddling" Xmas stamp and die set is probably my favorite one this year. Paired with a landscape LF die and a house print card stock by BellaBlvd this card came together really easily. To make the snow covered hills more realistic I used Paper Accents Pearlized Cardstock. Because this cardstock is slippery, I sprinkled the words and notes with embossing powder and used a heat gun to melt it onto the card. Here is another version of the same card. I can't decide which one is more appealing. Which do you prefer? 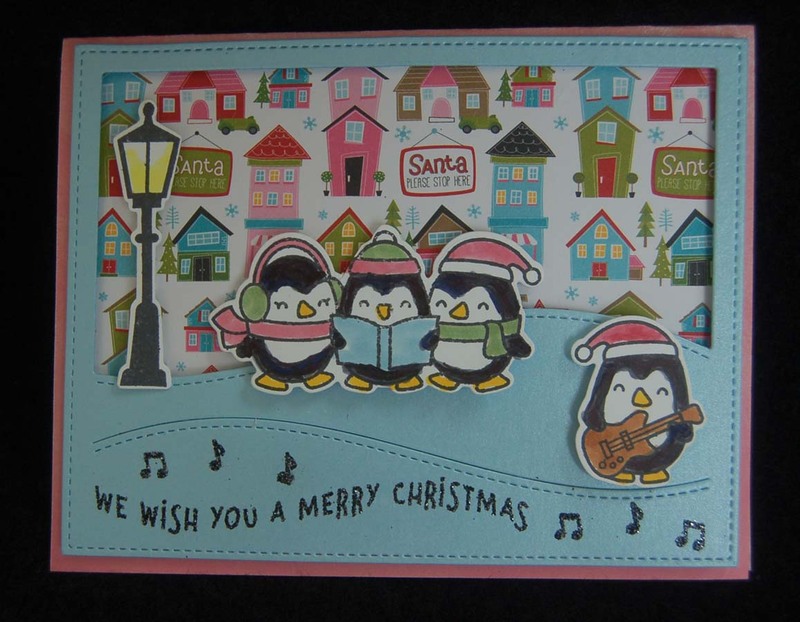 This time I remembered to cut (with the LF die) the gift card slots into the inside of the card front before adhering the landscape frame and penguins with adhesive foam squares. 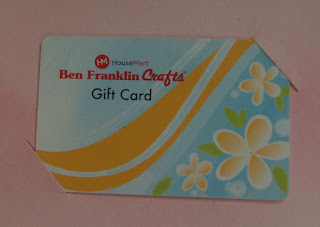 I will be giving more HM Ben Franklin Crafts gift cards this year mostly because they are so easy to purchase, mail, and I think the stores have something for everyone. Also, I love turning my Xmas cards into gift card holders with the use of the Lawn Fawn dies......so easy! Enjoy this Xmas Crafting Season!